Did you live, work, or attend school in Lower Manhattan at the time of the September 11 terrorist attacks or any time in the eight months following the attacks? Have you been diagnosed with cancer or a chronic respiratory illness? You may be eligible to benefit from the September 11 Victim Compensation Fund. Call Eisbrouch Marsh, LLC today at 212-643-0044 to discuss your case with an experienced lawyer and find out if you qualify for compensation. Our team of experienced personal injury attorneys offers free consultations for prospective Victim Compensation Fund claimants, and do not collect any fees until clients secure a settlement from the Victim Compensation Fund. 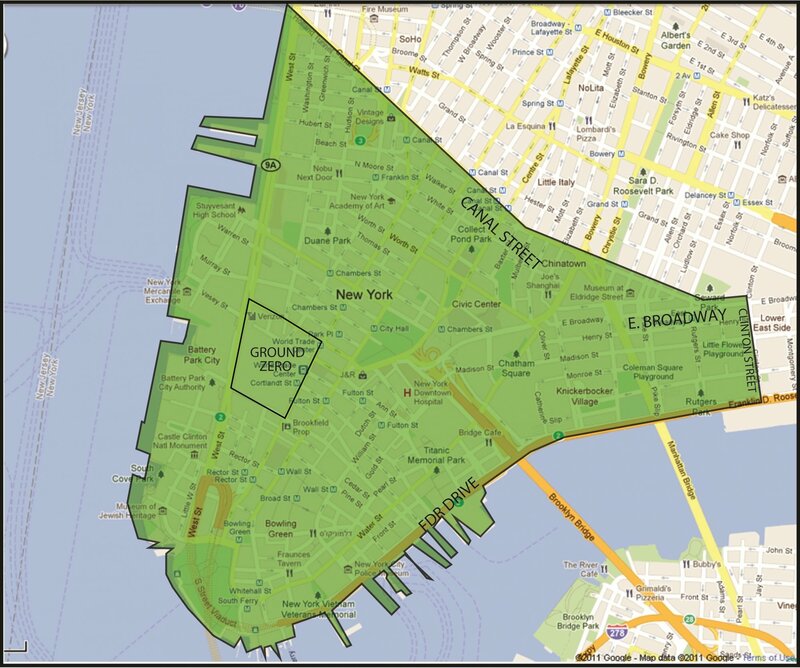 The “exposure zone” is defined as the area of lower Manhattan south of Canal Street/East Broadway/Clinton Street. Our experienced attorneys can determine if you were present in the toxic dust exposure zone during the eligible time period. You may also be eligible if you developed an illness or injury as a result of working or living along a route used for crash site debris removal. Eligibility also covers injured or sickened parties who were present at the Skanksville, PA and Pentagon terrorist attack sites. If your work brought you into contact with the chemicals, dust cloud or toxic debris from the NYC exposure zone, you may be eligible (such as working in the New York City Morgue or cleaning emergency vehicles that responded to Ground Zero). What Is the September 11 Victim Compensation Fund? The September 11th Victim Compensation Fund (VCF) is a federally funded program established to compensate victims for injury or death caused the terrorist attacks or the removal of debris from lower Manhattan in the aftermath of the tragedy of September 11. In 2011, President Obama signed the Zadroga Act into law. In 2015, the VCF was extended to accept claims for five more years, until December 18, 2020. 1. You were present in one of the crash sites or related debris removal routes during the specified time period. Ground Zero and the area of lower Manhattan south of Canal St./East Broadway/Clinton St.
(5) Any area related to, or along, routes of debris removal, such as barges and Fresh Kills." The toxic debris and dust from these crash sites affected tens of thousands of people. Hundreds have died as a result of their illnesses. 2. You were physically injured or sickened as a result, OR you are the personal representative of a person who died as a result of their illness or injury. The Zadroga Act includes many types cancer, respiratory illness and other health conditions. Ask our attorneys for clarification on your illness and whether you are eligible. Our attorneys will help you arrange the documentation and proof that you were present in one of the eligible zones at any point between 9/11/2001 and 5/30/2002. We also help our clients prove that they developed a qualifying injury or illness as result. You meet the filing deadline. These registration deadlines vary and are based on your individual circumstances. At Eisbrouch Marsh, we can help you meet the appropriate deadlines. You can demonstrate that you were present in the exposure zone. Do I Need an Attorney to File a VCF Claim? Eisbrouch Marsh attorneys are available to answer questions and facilitate the process of obtaining compensation. Those who attempt to file a Victim Compensation Fund claim without the benefit of legal representation are often stymied by requests for endless documentation. An experienced lawyer is in the best position to ensure you receive maximum compensation and you stay informed on the status of your claim every step of the way. Eisbrouch Marsh are compassionate, experienced lawyers who advocate on behalf of those suffering from chronic health problems after the 9/11 World Trade Center attacks. Known for our honesty, compassion and steadfast work ethic, our attorneys remain committed to obtaining the compensation your family needs and deserves. Call us today at 212-643-0044 for your free consultation. With offices in Hackensack, Newark, and New York City, our lawyers welcome clients from Bergen County, Essex County and all nearby areas.